Practice Chemical Engineering questions and answers for interviews, campus placements, online tests, aptitude tests, quizzes and competitive exams. This set of Basic Chemical Engineering Multiple Choice Questions & Answers (MCQs) focuses on “Measurement of Pressure”. 1. What is the pressure if 10 N of force is acting normally on 5 m2 surface area? Explanation: Pressure = 10/5 = 2Pa. 2. What is the pressure if 10 N of force acts at 60 degrees from the normal of a 5 m2 surface? Explanation: Normal component of the force = 10cos60o = 10*0.5 = 5 N, => Pressure = 5/5 = 1 Pa.
3. What is the pressure if 10 N of force acts at 30 degrees from the surface of area 5 m2? Explanation: Normal component of the force = 10sin30o = 10*0.5 = 5 N, => Pressure = 5/5 = 1 Pa.
4. What is the pressure of 1 mole of an ideal gas at 27oC occupying 1 Liter of volume? Explanation: For ideal gas PV = nRT, => P = 1*0.0821*300/1 = 24.63 atm. 5. An open tank 10 m deep is completely filled with a liquid of density 5 kg/m3, what is the pressure difference at the top and bottom? Explanation: Pressure difference = dgh = 5*10*10 = 500 N/m2. 6. 10 mm of water (density = 1000 kg/m3) and 5 mm of a liquid has the same pressure drop, what is the density of liquid? Explanation: pressure of water = pressure of liquid, => d1h1 = d2h2, => 10*1000 = 5*d2, => d = 2000 kg/m3. 7. Which of the following is not a pressure measuring device? Explanation: Galvanometer is used to measure current. 8. Bernoulli’s Equation is the conservation of? Explanation: Bernoulli’s equation is modified form of conservation of energy equation. 9. What is the pressure difference of the ends of a U-tube manometer filled with liquid (density = 10 kg/m3) the difference in the height of the liquid in the tubes is 5 cm? Explanation: Pressure difference = dgh = 10*10*0.05 = 5 N/m2. 10. A hydraulic lever has input surface area 2 m2, and output surface area 10 m2, if the input force is 5 N, then what is the output force? Explanation: Hydraulic lever works on the Pascal’s principle, => F1A1 = F2A2, => 5*2 = F2*10, => F2 = 1 N.
11. A Closed U-tube manometer has a gas at one end and vacuum at other end, if the height difference of the liquid (density = 10 kg/m3) in the manometer in 5 cm, what is the pressure of the gas? Explanation: Pressure of the gas = dgh = 10*10*0.05 = 5 N/m2. 12. Archimedes’ principle describes which of the following quantities? Explanation: Archimedes’ principle states that buoyant force on a body is equal to the weight of the body. 13. An object is dipped in water, if the weight of the object measured by spring balance is 10 g and buoyancy force acting on the object is 0.1 N then what is the actual mass of the object? Explanation: Weight of the object = (10*10–3)*10 + 0.1 = 0.2 N, => actual mass of the object = 0.2/10 = 0.02 kg = 20 g.
14. An open end manometer is filled with a gas on one end and other end is open to atmosphere with height difference of liquid (density = 10000 Kg/m3) 10 cm, what is the pressure of gas? Explanation: Pressure = 1 + 10000*10*0.1/101325 = 1.1 atm. 15. A closed end manometer is filled with a gas on one end and other end is close with vacuum, height difference of liquid (density = 10000 Kg/m3) 25 cm, what is the pressure of gas? Explanation: Pressure = 10000*10*0.25/101325 = 0.24 atm. 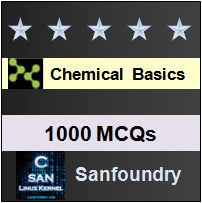 Sanfoundry Global Education & Learning Series – Basic Chemical Engineering. To practice all areas of Basic Chemical Engineering, here is complete set of 1000+ Multiple Choice Questions and Answers.